Sara Murray had never met her mother’s parents and was surprised to learn after her death that they were Amish living in Pennsylvania. When she is finally able to make the trip to meet them, she is shocked to learn someone else has been living with them and pretending to be Sara. Sara can’t understand how quickly her grandparents are willing to forgive the imposter. Secrets and deceit seem to follow Sara, and she is so tired of it. Though soon she meets Brad Fuller who is visiting her grandparents during Christmas. She likes him a lot, but even he seems to pull away from her, not being totally honest. 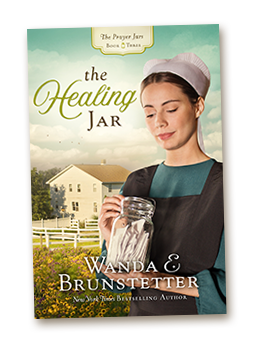 Struggling, Sara finds an old canning jar hidden in the basement of her grandparents’ home that is full of encouraging prayers. Can Sara find a way to forgive the past and move on to building new relationships? What if you have waited to find love only to be rejected when it finally comes? Lenore Lapp is an Amish schoolteacher in her late twenties living with grandparents to help out. 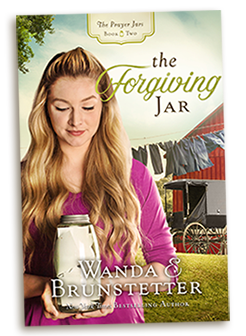 She thought love had passed her by until she met Jesse Smucker, a widower with a baby daughter. Lenore quickly falls in love with them both and accepts Jesse’s proposal of marriage, but Jesse breaks off their engagement when he realizes he can’t marry only for convenience. Resigned to living single, Lenore throws herself into caring for her elders. While working in her grandmother’s garden one day, she digs up an old jar. Will Lenore find healing for her broken heart and solve long-buried family secrets by reading the notes contained inside? Have you ever wondered what it would be like to live on an Amish farm, or visit one for an extended length of time? The main character in the first book of this 3-book series gets to do exactly that. The only problem is, she’s visiting the Amish farm with a false identity. During her stay, she discovers some antique jars (something my husband and I both enjoy collecting). 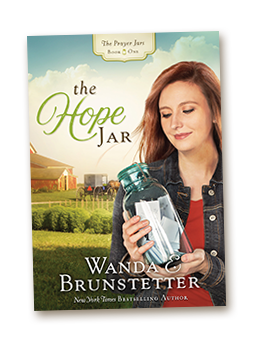 It was fun to see one of those old canning jars featured on the cover of The Hope Jar, not to mention that the model holding the jar is our granddaughter, Jinell.